Storms across northeast China since Wednesday have inundated parts of Jilin and Heilongjiang provinces. 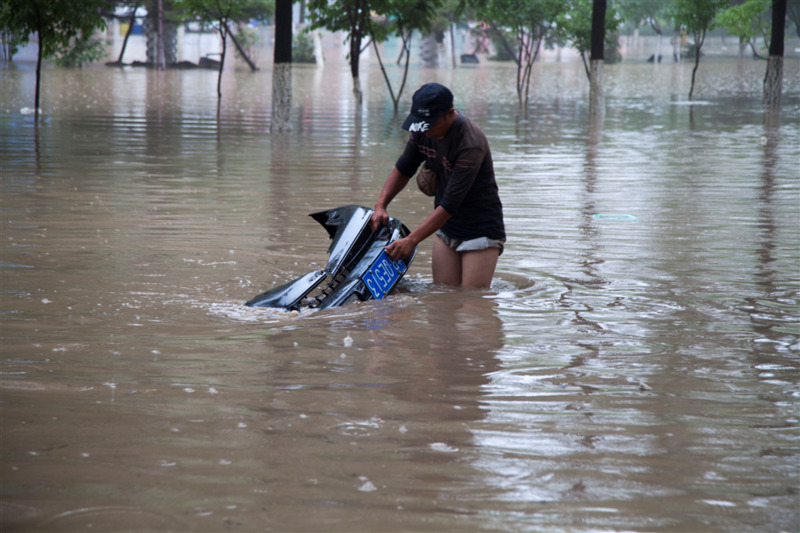 A man picks up a car bumper on a flooded road in Jilin City, Jilin Province, today. Storms across northeast China since Wednesday have inundated parts of Jilin and Heilongjiang provinces, blocking road access and cutting communication networks to about 1,100 households. In Yongji County, Jilin, where heavy downpours last week were linked to 18 deaths and 18 missing, rain on Wednesday evening flooded the county seat. No casualties have been reported yet. The rain has been so heavy that vehicles including mini vans are submerged, according to reporters at the scene. Local authorities began relocating residents on Wednesday afternoon. The provincial observatory forecast Thursday morning warned that in the next 12 hours, up to 60 millimeters of rain would fall in Jilin City, an area prone to mountain torrents and flooding. Last week in Jilin, more than 110,000 people had to relocated as rain battered the city. A 32,360-strong search and rescue team has been deployed to clear the sludge and debris, repair bridges, and reconnect households to telecommunications and electricity networks. "My shop was again hit, with sludge damaging all my supplies. I had only just cleaned up from the flooding last week," said Zhang Hua, a shop owner in Yongji. Meanwhile, in Shangzhi, Heilongjiang Province, more than 1,100 households in a forest area are without communication networks. The rain, since Wednesday afternoon, has damaged roads and other facilities. No casualty report has been released. Local authorities have dispatched several rescue teams to try to reach the area, and sent disaster relief goods including clothes and quilts. Yu Jianguo, a fire officer with the public security bureau in Harbin, the provincial capital of Heilongjiang, has led a response team in speedboats to Weihe River Forest Farm. However, the team could not be reached by phone due to the telecommunication disruption.